Are you interesting in learning more about Crack the Fat Loss Code, the popular weight loss program and diet book written by fitness expert Wendy Chant? This eating plan is being hailed by many dieters as the key to rapid and long lasting weight loss. Developed by renowned nutrition and fitness expert Wendy Chant, this diet plan is based on the premise that it's possible to lose weight without having hunger and without having to give up the foods you enjoy eating. This diet plan is an eight week program designed to bring about lasting weight loss by increasing metabolic function. Many people who experience difficulty losing weight attribute it to a "slow metabolism", reporting an inability to drop pounds in spite of strict diet and aggressive exercise programs. Others who are able to lose weight initially often report slowed or diminished weight loss due to reaching what is referred to as a "plateau". The nutritional program focuses on taking steps designed to boost one's metabolism for peak fat burning capacity. It is designed to result in weight loss success by combating problems with metabolism and diet plateaus. There are no forbidden foods on this diet plan. Instead of removing certain foods from one's diet, this eating plan focuses on what's referred to as "cycling" of carbohydrate consumption. The diet features days of increased carbohydrate consumption, reduced consumption of carbohydrates, and days when consumption should remain at a baseline level. There is no reason to go hungry when following this plan, as dieters are encouraged to enjoy four to six meals daily. Throughout the program, protein should be eaten with every meal. For the first week, dieters keep their consumption of carbohydrates relatively low, to less than 20 grams per day. This is similar to the two-week induction period recommended by the Atkins diet as well as the introductory phase of the South Beach Diet. Following the initial week, dieters must follow the guidelines for how many servings of carbohydrates to eat and what time of day they can be eaten. There are even built-in cheat days so dieters can plan ahead to enjoy their favorite foods without sabotaging their weight loss goals. If you're interested in trying the diet, you can find out the specifics by reading the book, or by enrolling in a class at Forever Fit, if you live near Altamonte Springs. 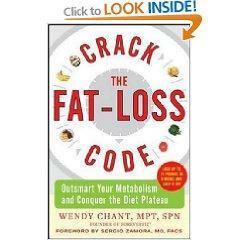 Author Wendy Chant has long been recognized as a leading specialist in the field of nutrition. Chant has owned Forever Fit, a training and wellness center in Altamonte Springs, Florida since 1998. She began teaching nutrition and diet classes at the center long before publishing Crack the Fat Loss Code in 2008. She speaks and teaches nutrition, weight loss, and wellness classes and seminars for clients around the world. Chant lives the fitness oriented lifestyle advocated in her business, speaking and writing. During her career, she has worked as a personal trainer and has also been a competitive body builder and marathon runner. She holds a Bachelor's degree in Medical Science and Nutritional Science, and is credentialed a Certified Master Personal Trainer (MTP) and as a Specialist in Performance Nutrition (SPN). What Do Dieters Have to Say? If you want more information before investing in the book, you may be able to find a copy at your local library. The book is very affordable, so you may just want to purchase your own copy. It published by McGraw-Hill in 2008 and is available from Amazon.com as well as from various other bookstores and online retailers.